Another nice design feature of Xperia Z is water and dust resistant. Spilling of coffee is not an issue for Xperia Z. You can even use the phone when shower. You can even wash it with water or soak it in water! Of course, you need make sure the water-tight protectors for ports are on. Samsung Galaxy S4 simply has no words in front of Xperia Z when talking about design and build quality is talked. Galaxy S4 is packed with a 2600mAh battery; while Xperia Z with a 2330mAh one. The battery life should have no big difference. For most users, this is sufficient for 9-to-5 usage.. However, the battery in Galaxy S4 is removable; while the one in Xperia Z is non-removable. Clearly, removable battery gives at least three advantages: 1). you may prepare and a spare battery in a long trip; 2). you may replace your battery at reasonable price after one or two years when the battery lose its capacity significantly; and 3). you may use a third party battery with higher capacity if you are a heavy users (sometimes you may have to change the back cover). So, Galaxy S4 wins this round due to its removable battery. 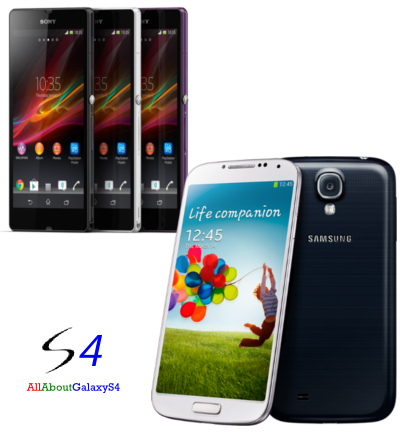 Xperia Z comes with Jelly Bean 4.1 (Sony will update this phone to 4.2); while Galaxy S4 comes with Jelly Bean 4.2. If you check the track record of OS update for Samsung and Sony, you will notice Samsung updates faster and gives more major update. Very likely, Galaxy S4 will get Android 5.0 ( Key Lime Pie), which will be announced in Google I/O 2013 this May. Xperia Z may be not. For the Android skin, Samsung’s TouchWiz is over-bloated. A lot of changes (to Android stock ones) are just for the sake of change. Xperia Z’s Android UI is quite clean and simple. Most of the changes do improve the stock ones. So, Samsung wins on Android update, while Sony wins in skin. Both Galaxy S4 and Xperia Z are packed with similar camera (13MP rear, 2/2.2MP front). Xperia Z has HDR (high dynamic range) for video to boost video quality. But based on my hands-on experience, this is not as awesome as advertised. Galaxy S4 packs a very cool feature: dual camera. You can use both cameras fora photo or a video. Most users will find this is more useful than HDR. If you are looking for a dedicated camera button in Xperia Z (a few other Xperia models do have), you will be disappointed. No hardware button for camera. Of course, Samsung never provides hardware button for camera in all Galaxy phones. Surprising, Xperia Z loses this round in camera and video, although Sony’s camera is better than Samsung’s in almost all aspects. Ironically, the Galaxy S4’s camera/image sensor is soured from Sony. Both Xperia Z and Galaxy S4 have a full HD (1920*1080) display with similar size (5″). The pixel density is similar (441ppi), so the display in both phones are sharp enough for our eyes. But there are some difference in the panel. XperiaZ still uses the TFT panel, just like other Sony mobile phones, not the IPS. This means the viewing angle, and color re-production is not so good, although Sony has some own technologies for such displays. So, the view angle and colorfulness are inferior to AMOLED panel in Galaxy S4. For the display technology comparison, you may check this post on AMOLED, TFT and IPS. So, Galaxy S4 wins this round in display. In five rounds, Galaxy S4 wins three in battery, display, and camera and video; Xperia Z wins one in design and build quality. For the software, it is a tie: Xperia Z wins in skin (UI), and Galaxy S4 wins in Android update.